Given that Steines was immediately removed from the Home & Family site, more than a few people wondered if there was more to the story. Today, Hallmark made it clear that the channel had no issues with Steines. Management wants to take the series in a different direction and Steines was not part of that change. 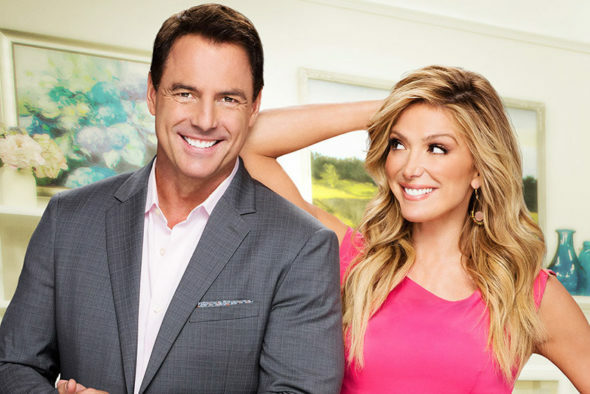 According to Deadline, Steines was blindsided by Hallmark’s plans and was told he was off the show only after he finished taping Thursday’s show (on Wednesday). According to a representative of Steines, he was let go for “creative reasons”. The rep noted, “We had had nothing but positive reviews and feedback from Hallmark for the entirety of the time he has been on the show, including this year.” It is believed that Steines still had time left on his contract so it wasn’t about contract negotiations. Steines’ co-host, Debbie Matenopoulos, fought back tears as she delivered the news to viewers at the end of today’s show. She was surrounded by seven contributors on the show’s couch. Welcome back, everybody. So, I’m here to share some news. And the family has joined me because we truly are a family here. Now, although we had a great show, we have a hard announcement to make. We have a very hard announcement to deliver. Our dear friend, our very good friend, and my wonderful co-host for years, Mister Mark Steines, is no longer with Home & Family. He has been an amazing friend to all of us here at Hallmark Channel, the cast, the crew and a wonderful friend to all of you at home as well. And we are grateful to Mark, and we want to thank him from the bottom of our hearts for six of the most incredible years that he has had here hosting this incredible show that, he helped build. He really did. He’s been here from the beginning and a lot of this show has Mark’s handprint on it, so we support him in everything he does in the future, his future endeavors. We will miss him dearly and we will think about him fondly and often and we thank you all at home for your kindness and understanding and your support and for being part of our family every day. Thank you so much, everyone. Thank you for joining us and we’ll see you back here on Monday. This isn’t the first time that a Home & Family co-host has been suddenly dropped from the program’s “family”. Matenopoulos’ predecessor, Cristina Ferrare, was quietly removed from the program nearly two years ago. She had theoretically been on vacation for two weeks before it was announced that she was simply no longer with the program. This led many viewers to assume that Ferrare was sick (which was not the case) and led to a lot of hard feelings from viewers toward her replacement. It’s unclear if Steines will be replaced. On Monday’s show, Matenopoulos will be joined by guest host James Denton, one of the stars of Hallmark’s Good Witch series. What do you think? Are you sorry that Steines has been fired by Hallmark? Will you continue to watch the Home & Family TV show? If they wanted to make a change, could Hallmark have handled this in a better way? More about: Hallmark Channel TV shows: canceled or renewed?, Home & Family, Home & Family: canceled or renewed? Home & Family: Why Did Cristina Ferrare Leave the Hallmark Series? I didn’t even know Mark was off the show. I stopped watching after what they did to Christina. Shame of you. He is a great host and will be missed….we don’t like change ……your guest host is a great guy, so it is not about him at all…. As a die hard fan of the shown, I am very disappointed that Mark Steins got fired! Also Debbie is so annoying and very fake in everything she does with each segment. I have not watch the show since Mark left. Get rid of Debbie and I may watch again. I completely agree with you… I haven’t watched it since they got rid of Cristina Ferrare… That Debbie is so into herself.. I rarely, if ever comment online due to all the “rhetoric”, however I felt compelled to post an opinion on the removal of two co-hosts from this show. Hallmark Home and Family has a reputation of an honest, ethical and family show. The quick removal of these cohosts depicts the opposite of family values and integrity. I, too, have also ceased to watch this show . The Hallmark channel in general, seems to slowly be gravitating away from the values it once depicted and promoted. I stopped watching when Christina was let go. I’m not surprised that they did this to Mark. I quit watching Home & Family after Christina F. left. I loved her and now Mark S.?!? Those two were the best! Im just thankful I don’t work for Home and Family!!! You promote family values , love and caring for your employees. You should be ashamed of your behavior. I occasionally watch a movie but no more Home and Family! Debbie is annoying! I REALLY MISS MARK STINE. SHOW IS NOT THE SAME WITHOUT HIM. Also, I kept waiting for Christina to return. And of course she never did. I loved her so much. She and Mark was my reason for watching. You can have GREAT guests but you also need GREAT hosts. And that was Christina and Mark. I use to watch each day but now only once in awhile. I really, really liked Mark very much. he and Christina and Debbie were so at ease together. I like James, as he is from Days and movies, but he is not as likeable and at ease with Debbie as Mark was. Wish he would come back. Please re-estate him.